Consumers should be aware of a recent recall involving several food products, according to a report from the Canadian Food Inspection Agency (CFIA). 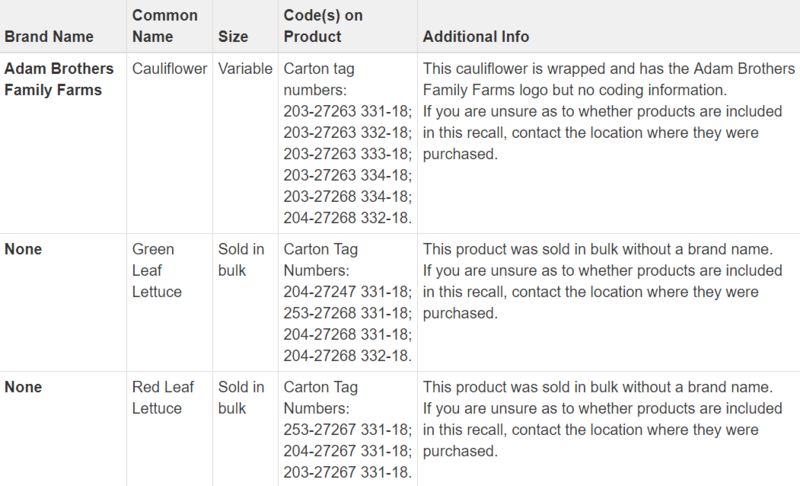 Certain cauliflower, red leaf lettuce, and green leaf lettuce products are being recalled due to possible E. coli contamination. The products, produced by American company Adam Bros. Farming Inc., have been sold in Ontario and other provinces. The CFIA warns that food contaminated with E. coli may not look or smell spoiled but can still make you sick with symptoms including nausea, vomiting, mild to severe abdominal cramps, and diarrhea. Consumers are advised to throw these products out or return them to the store they were purchased from, and contact a doctor if they believe they became sick from eating recalled food.